Leading Manufacturer of float level switch, displacer level switch, float switch, float type level switch, horizontal magnetic float level switch and magnetic float level switch from Vadodara. KABIR” Make Top Mounted Magnetic Level Switch moves up and down on probe immersed in a liquid. The float energizes the hermetically sealed sensors, which changes from NO to NC or otherwise as the float - passes them. The reed Switch operates NO to NC which is potential free contact. 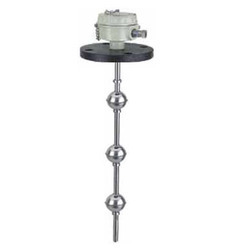 We are an unparalleled name in offering a comprehensive assortment of Displacer Level Switch. Our entire range of switch is most versatile for level control. The offered switch is highly acclaimed among customers for its operational fluency. Moreover, our switch is offered in various customized options as per precise needs of our patrons. 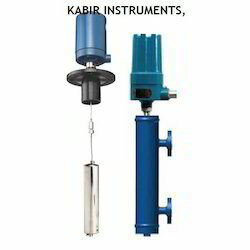 "Kabir” make Multi Point Magnetic Float Level Switch which are useful for larger tanks monitoring up to eight independent levels in a single device. These are available in length up to 3500 mm and are manufactured using various combinations of floats depend upon the services, various mounting and materials. These are able to effectively track changing levels within the tanks and are proficient in monitoring liquid interfaces of dissimilar liquids in single tank line oil- water separations, chemical emulsions or condensation levels. Kabir make Float level switch and Leveraging on the skills of our qualified professionals, we manufacture, export and supply an extensive array of Float type Level Switch. Designed with high mechanical sealing strength, this switch is available in numerous specifications as per the need of our patrons. We ensure our customers that our switch is quality tested on predefined parameters. Additionally, this switch is provided at highly competitive price. Compact & rugged construction consisting of a free moving pivoted float assembly and a switch enclosure in non - magnetic material to achieve undisturbed magnetic flux. It employs dual magnets, one carried by the float arm and other by the contact carriers housed in the switch enclosure. A change in liquid level brings the like poles of dual magnets opposite to each other and resulting repulsion force ensures a changeover of contacts with snap action. The magnetic transmission is glandless, leaving no scope for leakages from vessel into switch housing. These switches are manufactured in various materials, enclosures & special features to suit broad range of media / applications. They are designed to provide high repeatability and to minimizes effects of shock, vibration & Pressure. 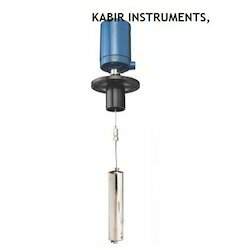 "Kabir" make Multi Point Magnetic Float Level Switch which are useful for larger tanks monitoring up to eight independent levels in a single device. These are available in length up to 3500 mm and are manufactured using various combinations of floats depend upon the services, various mounting and materials. These are able to effectively track changing levels within the tanks and are proficient in monitoring liquid interfaces of dissimilar liquids in single tank line oil- water separations, chemical emulsions or condensation levels. Chamber. Compact & rugged construction consisting of a free moving pivoted float assembly and a switch enclosure in non - magnetic material to achieve undisturbed magnetic flux. It employs dual magnets, one carried by the float arm and other by the contact carriers housed in the switch enclosure. A change in liquid level brings the like poles of dual magnets opposite to each other and resulting repulsion force ensures a changeover of contacts with snap action. The magnetic transmission is glandless, leaving no scope for leakages from vessel into switch housing. These switches are manufactured in various materials, enclosures & special features to suit broad range of media / applications. They are designed to provide high repeatability and to minimizes effects of shock, vibration & Pressure. The electronically stimulated fork vibrates at its mechanically resonance frequency of 125 Hz when the fork is free of the service material. The resonance is caused by the piezoelectric crystals. One of the piezo crystals produces a small voltage which is transmitted to the switching amplifier. If the fork is covered by the bulk material, a damping effect is produced and the piezo crystal does not produce the voltage and the amplifier will switch and a corresponding signal output is actuated. The vibration of the fork has self-cleaning properties.The light deposit on the container wal l does not af fect the operation of the kabir fork. 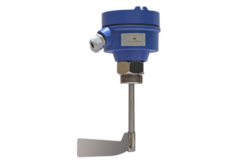 KABIRROTO heavy duty, rotary paddle switches are the most suitable for level detection of dust granules and other free flowing solids up to the particle size of Ã�10 mm. Mounted in bins, silos and hoppers it can be applied for control of level, filling and emptying as well as for protection against overfilling. 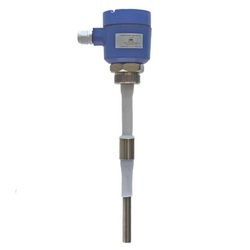 We manufacture, export and supply a range of Rotating Paddle Point Level Switch. The Rotating Paddle Point Level Switch is widely in demand owning to durable quality, precise designs and effective performance. 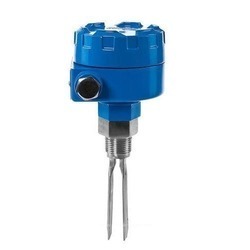 The Rotating Paddle Point Level Switch finds application in Agriculture beet slice, hard crop, Chemical industry plastic powders, pellets and many more industries. Rotating Paddle Point Level Switch, offered by us, comes in excellent packaging material. Building industry Sand, Calcium powder, Gypsum, Coffee and Cacao Powder, Flour, Sugar, etc. KABIRROTO heavy duty, rotary paddle switches are the most suitable for level detection of dust granules and other free flowing solids up to the particle size of A10 mm. Mounted in bins, silos and hoppers it can be applied for control of level, filling and emptying as well as for protection against overfilling. The electronically stimulated fork vibrates at its mechanically resonance frequency of 125 Hz when the fork is free of the service material. The resonance is caused by the piezoelectric crystals. One of the piezo crystals produces a small voltage which is transmitted to the switching amplifier. If the fork is covered by the bulk material, a damping effect is produced and the piezo crystal does not produce the voltage and the amplifier will switch and a corresponding signal output is actuated. 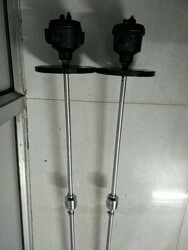 The vibration of the fork has self-cleaning properties.The light deposit on the container wal l does not af fect the operation of the kabirFORK. We are Manufacturer of rd level switch and its parts Housing : Aluminium, weatherproof IP 67, powder coated , integral with the probe mounting Cable Entry : 1 no.s (standard) Ambinent temperate : 0 Power consumption : 0.15 W Mains Voltage : 18 to30 VDC Output : PNP NO/NC Operating Frequency : 6 KHz COAT GUARD SENSING PROBE: Mounting : Screwed BSP (standard) Or Flanged (optional) or as per specification. Insulation : PTFE (standard)Other on request and as per application. Operating Temp in :100 deg for the integral switching vessel unit. For higher temp remote switching unit(please consult works) THEORY: The RF level switch operates on the basis of RF absorption measurement. The electronic unit generates a sinusoidal wave, applied to the electrode creating a field around it. RF environment absorption changes (electrical loss) around the electrode are reflected on changes of generator supply current. Such changes, caused by the increase in level is amplified and used to energies the relay. The main drawback of the conventional method is that after the level has once increased and then decreased, there may be a coating left on the probe which is sensed by the instrument as though the level is still on the probe. In KABIRADMIT a COAT GUARD and Trance Conductance amplifier are incorporated in the circuit having its output exactly at the same voltage and phase at all times as its input. The output is connected through the shield of the low capacitance co-axial cable to the concentric tube on the sense probe, called shield element. Since both the elements, sense and shield are exactly at the same potential and phase at all times, there is no current flow through the cable. Thus there is no change in calibration due to coating on the probe and the temperature effect of the cable. 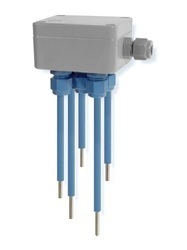 KABIR make Offered in both vertical and horizontal configurations, the general purpose mini-float level switches provide reliable liquid level detection of clean water and chemical solutions with a 15VA or 30VA reed switch output. Media examples include water and sulfuric acid. 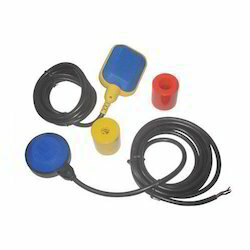 The polypropylene or PVDF liquid level sensors are mounted vertically inside the tank or horizontally through the tank wall as a high level alarm or low level alarm. “KABIR” Make Magnetic Level Switches is specially suitable for high and low level signalization or automatic level control (by starting &stopping pumps or opening & closing of valves) in vessels. Horizontal mounting type directly on vessel or on External Chamber. 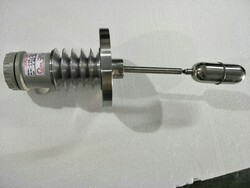 The side mounted float level Switch is manufactured specifically for horizontal mounting in a tank or vessel. They work well as high or low level control. The Micro-Switch type OR Reed Switch is usable even at ambient temp. of 150°C max. KABIR is engaged with manufacturing of finest quality Cable float Switch. Cable Float Switch is a control device for automatic On/Off pumps, motor and magnetic valves. It is also an alarm device at certain pre-determined surface levels. It is suitable for use in non-flammable liquids at 250 volts. In dangerous environments (e.g. wells and pumping stations) we recommend 24 V voltage OR 230 VAC 15 AMP . In potentially explosive atmospheres (e.g. oil tanks) the Switch can be used in conjunction with (Ex) I-isolator switch units. Due to its large float casing the float Switch has a buoyancy which guarantees smooth, trouble-free operation under all conditions. The switch has double chamber and a final remoulding finish to make it absolutely hermetic. Installation:Cable Float Switch is simply placed in the liquid so that the float follows the movement of the surface. The switching height differential is adjusted by moving the weight along the cable. The differential is minimum, when weight is nearest to the float. If the viscosity of the liquid is high, we recommend an extra weight on the cable. 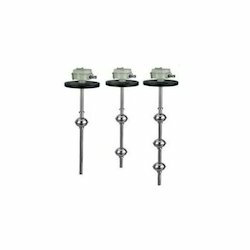 We specialize in providing a range of Cable Type Balloon Level Switch that is appreciated for their optimum quality, durability and easy installation. 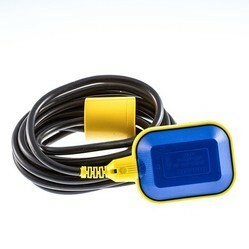 Being the leaders in the industry, we present Cable Float Level Switch to our clients. They require minimum maintenance and are presented at the best rates in the industry. This water level sensor is conducive for liquids that have a Conductivity Level Switch of equal to or more than 25m Siemens. It is your best choice for a water level switch. The system is economical to install as no special cable is required for signal transmission. 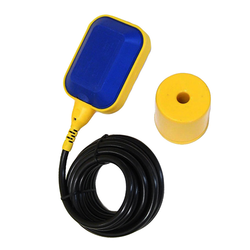 The level probe and the evaluation unit can be connected using a long cable. The AC is provided on the probe for preventing electrode deterioration. KABIR MAKE Switches are the most versatile for level control and have advantages over float type switches in the control of agitated liquids paints-varnishes & heavy oil and foaming liquids. The Displacer weight is heavier than the liquid which is suspended by a spring. When the liquid rises the displacer loses the weight, this causes the spring to retract slightly to a new equilibrium position. This retracts of the spring interchanges the position of the Magnet provided at the top and actuates the switch. Up to three independent switch junctions are available in the single unit, with the broad choice of operating sequences. 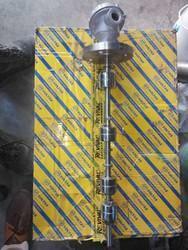 These are flange mounted and are available with a choice of material of construction. It is based on buoyancy principle and is available in different material of construction for a variety of switching functions. The instrument can be used for level switching function in large tanks up to 20mtr, in turbulent liquids and even without steel pipes. The switch position can be adjusted at site depending upon the requirement. It works reliably up to 300ºC temperature & 40 Kg/cm² pressure. The Material of construction may be MS, SS304/SS316 OR PP and the enclosure protection confirms to IP65/IP67/Ex-proof IIA & IIB or IIC. It is economical for large vessels & can be easily transported. These Switches are the most versatile for level control and have advantages over float type switches in the control of agitated liquids paints-varnishes heavy oil and foaming liquids. The Displacer weight is heavier than the liquid which is suspended by a spring. When the liquid rises the displacer looses the weight, this causes the spring to retract slightly to a new equilibrium position. This retracts of the spring interchanges the position of the Magnet provided at the top and actuates the switch. Upto three independent switch junctions are available in the single unit, with broad choice of operating sequences. These are flange mounted and are available with a choice of material of construction. These Switches are the most versatile for level control and have advantages over float type switches in the control of agitated liquids paints-varnishes & heavy oil and foaming liquids. The Displacer weight is heavier than the liquid which is suspended by a spring. When the liquid rises the displacer looses the weight, this causes the spring to retract slightly to a new equilibrium position. This retracts of the spring interchanges the position of the Magnet provided at the top and actuates the switch. Upto three independent switch junctions are available in the single unit, with broad choice of operating sequences. These are flange mounted and are available with a choice of material of construction. With the assistance of our qualified professionals, we are devotedly engaged in introducing a comprehensive range of Liquid Level Switch Sensor. Our entire range of switch sensor is designed using high quality raw material in compliance with international standards. 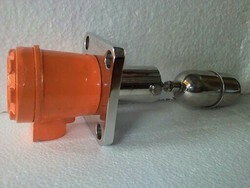 The offered switch sensor is use in drinking water systems, gas & oil industry. 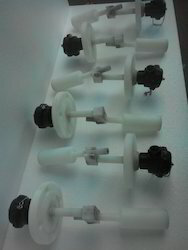 Moreover, our switch sensor is offered in various customized options as per precise needs of our patrons. Looking for Level Switch ?